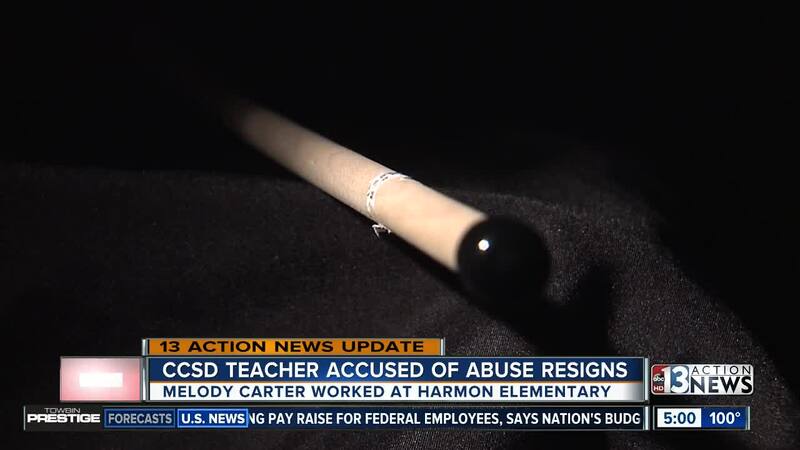 A Las Vegas special needs teacher once accused of striking a special needs boy so hard with a wooden pointer that it made a sound as it passed through the air has resigned. A Clark County School District spokesperson tells Contact 13 that long-time teacher Melody Carter resigned effective Aug. 8, 2018. Just a week before she tendered her resignation, Contact 13 reported Carter was before a judge on felony child abuse charge stemming from a May 2018 incident involving student JJ Wahrer. Josh Wahrer, JJ's father, spoke to Contact 13 in July after a conversation with the Clark County District Attorney's office which led him to believe the charge against Carter could be reduced to a misdemeanor, or dismissed all together. Wahrer feared a reduction or even dismissal of the charge could set up a possible return for Carter to a Clark County School District classroom. "We wanted to make sure that she didn't have the opportunity to do this to somebody else's child, so to hear she could potentially end up in a classroom again is very disheartening," Wahrer said. Wahrer tells Contact 13 he is now more at ease after Carter's resignation. According to the school district, Carter was hired as a teacher in 1996.